Attention Moms and Dads of creative tweens! 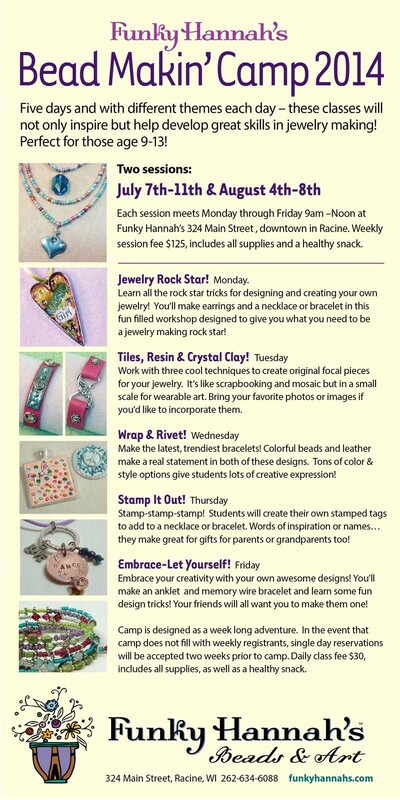 Funky Hannah’s Bead Makin’ Camp 2014 is just around the corner! We’re offering two sessions for you to pick from – July 7th – 11th and August 4th – 8th from 9am-noon. 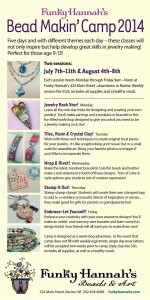 Each day features a different project designed to teach jewelry making skills and inspire creativity. Perfect for ages 9-13. Cost is $125 per week, all inclusive. Give us a call to register – 262-634-6088! Download the flyer here.